LiLoPe: Egg Warmers! Happy Easter!! Ah! It's spring! There has been so much stuff going on this year! Starting with my sisters wedding and me going studying at the university. Time has just flown by and it has been so much fun! Only downside has been that I haven't had much time to crochet or do other crafty thingies! Evenings have been filled with lots and lots of never ending homework! But now it's Easter (little holiday!!!) 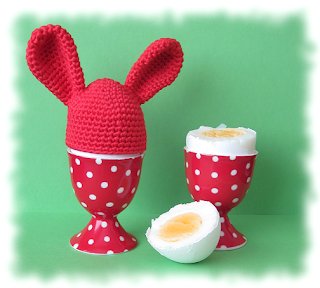 and my hands have been craving for some crafting so I thought to myself what would be a fun project and came up with Egg Warmers :)..especially egg warmers with bunny ears!